Cirque du Soleil’s mind-blowing show “O” at Bellagio in Las Vegas set the stage for their romance. Once ignited there was no dousing it. 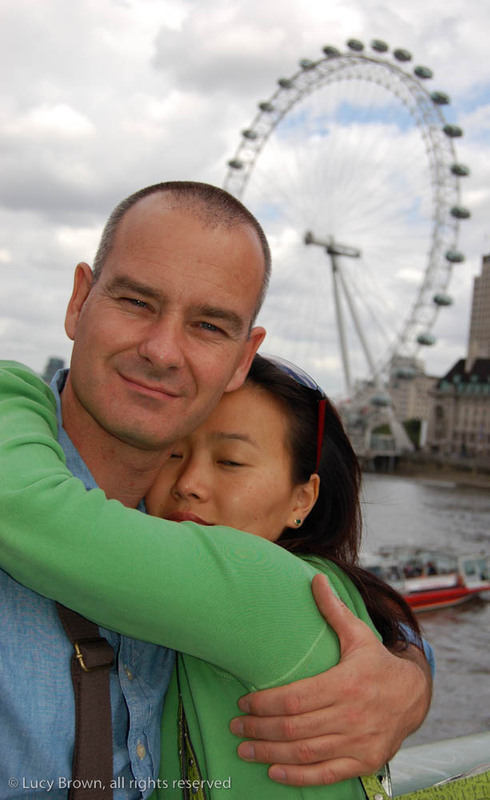 An Englishman and a Mongolian. 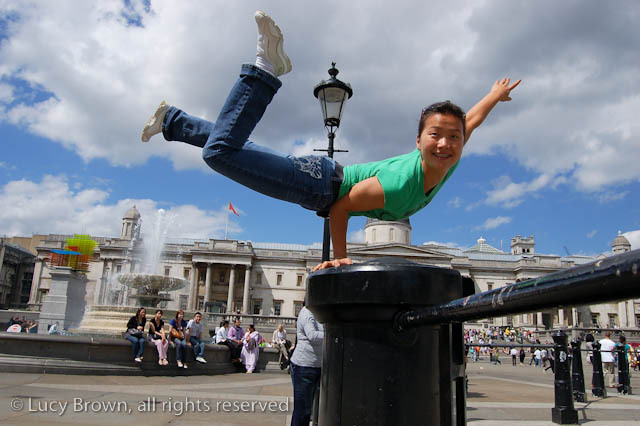 A fire artist and a contortionist. Now that would’ve aroused my interest under any circumstances but this was my brother getting hitched. 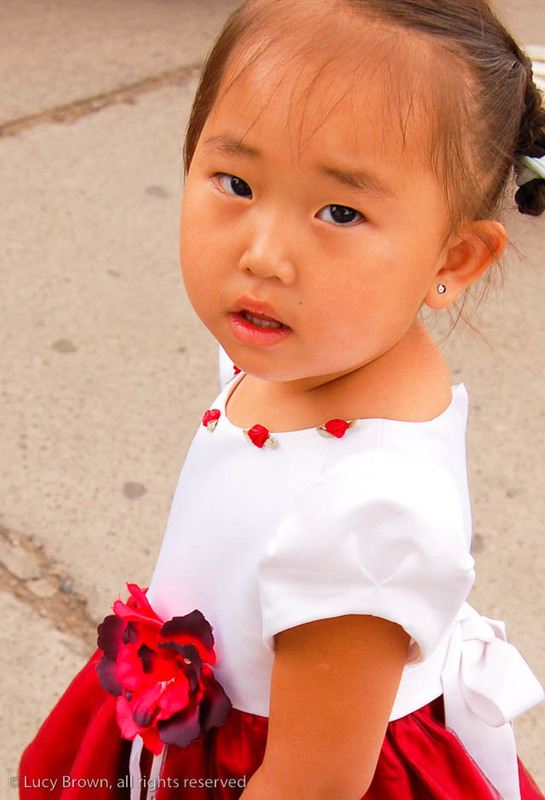 Location Ulaanbaatar, the capital of Mongolia. There’s no way in the world I would’ve missed that wedding. The following posts are a photo documentary of the day. We arrived to collect the bride, Anna. 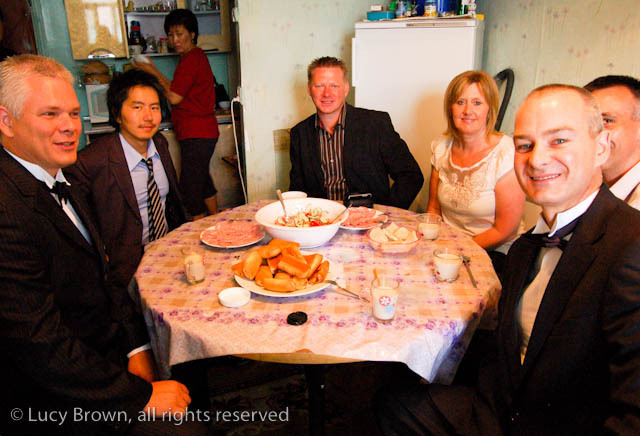 Her parents greeted us with traditional Mongolian milk tea and breakfast while her sisters helped her get ready in the next room. Mike my younger brother is the groom (right) and Matt my older brother is the best man (left). 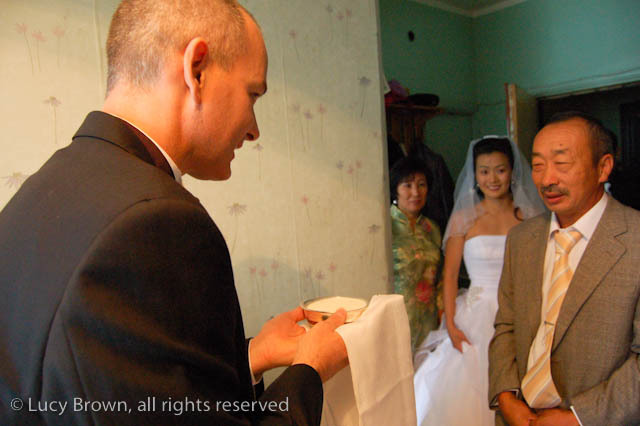 The bride appears and Anna’s father offers the groom Mongolian milk tea according to tradition. During formal occasions food, tea or vodka is given and received with the right hand extended and the left hand supporting the right elbow. Also they roll down the sleeves first to show respect. The same cup is then passed around ceremoniously so everyone gets a sip of the milk tea. 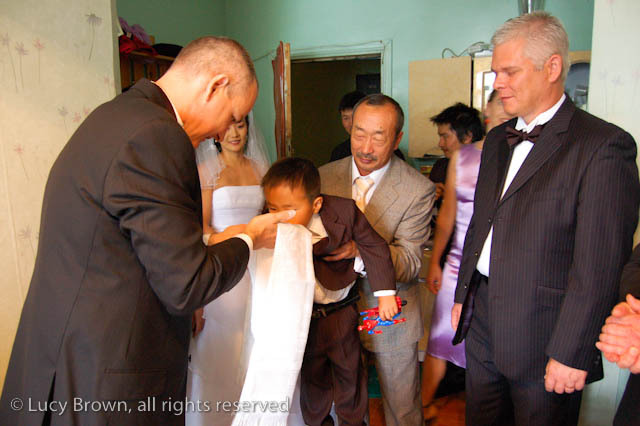 After receiving the cup each person hands it back to the groom to offer to the next person. The first shots of the bride and groom together. Anna’s mother offers her a cup of milk tea. The bride and groom. Still waiting to leave the family’s apartment. The bride’s father helps her into the car. 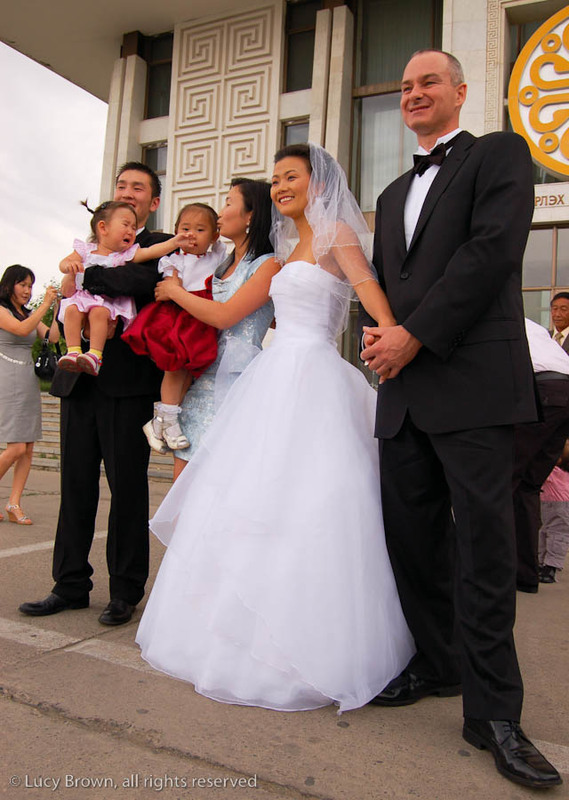 A photo shoot outside the Wedding Palace while waiting for their allotted time. 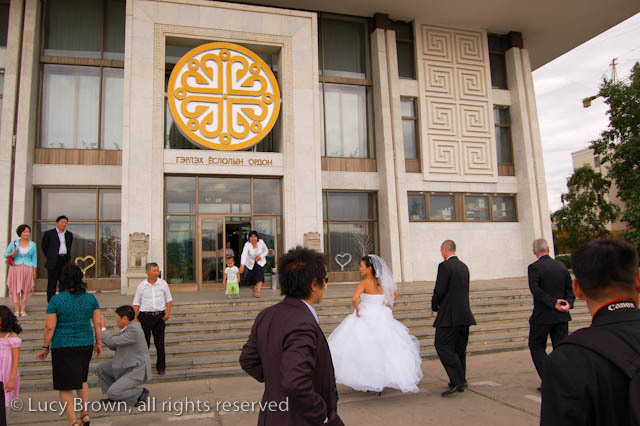 Each couple has half an hour for the ceremony so punctuality is crucial. That day the traffic was worse than usual and we thought we weren’t going to arrive on time but there were still a few minutes spare to take photos. 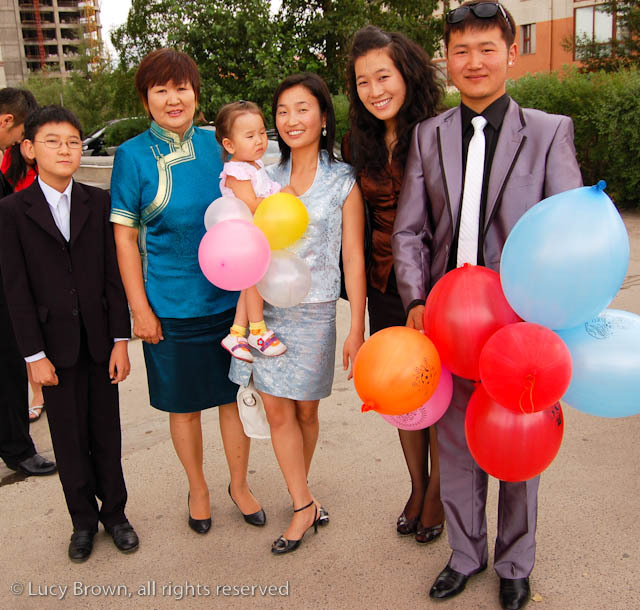 Various family members pose for photos. Time for the bride, groom and best man to enter the Wedding Palace. Anna’s niece watching the preparations to decorate the car. Some of Anna’s family while waiting to go into the Wedding Palace. 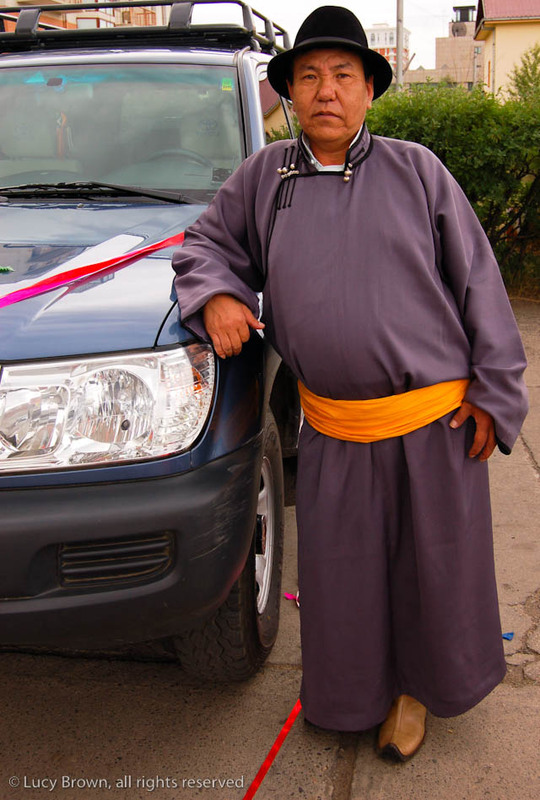 Anna’s uncle posing in traditional Mongolian costume. 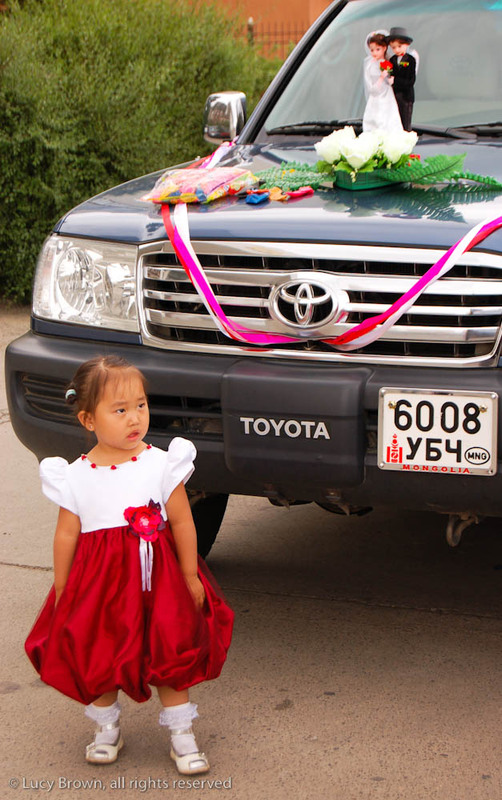 Mongolian registration plate on the wedding car. 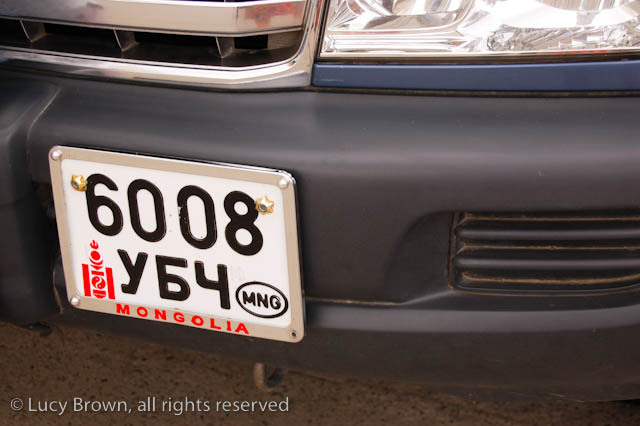 The red symbol on the left is the national emblem or the Soyombo seen everywhere including on the Mongolian flag. It has representations of fire, sun, moon, earth, water and the Taijitu or Yin-Yang symbol. 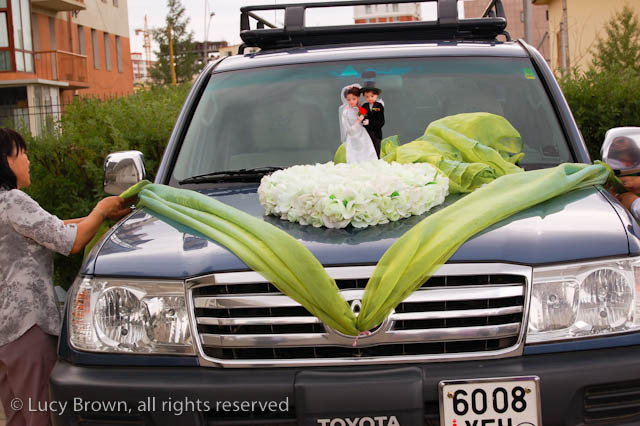 Family members decorating the wedding car before the ceremony. This entry was posted on October 26, 2010 by loca4motion. 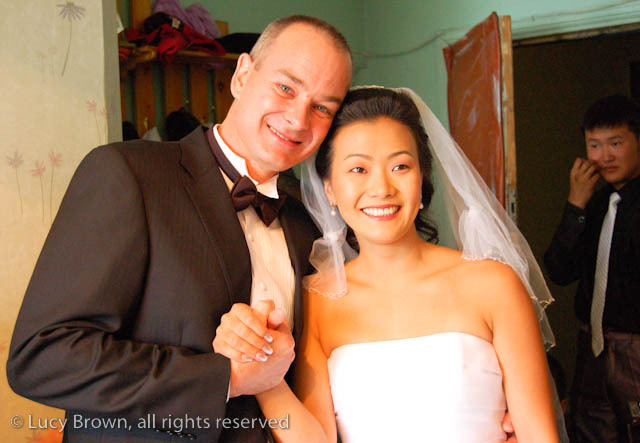 It was filed under Asia, Mongolia and was tagged with bellagio, cirque du soleil, contortionist, culture, fire artist, mongolia, mongolian, mongolian deel, mongolian wedding, mongolian wedding car, photography, traditions, travel, ulaanbaatar, wedding, wedding palace.